I can promise you that every student who comes to MTSU with the drive to achieve will be met with the best instruction from excellent professors who care for their success. At MTSU, we have created a culture of high expectations, coupled with personal attention when students struggle inside or outside the classroom. It’s all a part of MTSU’s Quest for Student Success, a series of recent reforms aimed at increasing retention and graduation. Gov. Bill Haslam also recently established local governing boards for MTSU and the other five former Tennessee Board of Regents universities. The new local structure allows greater latitude in setting our own strategic priorities and lets each institution play to its strengths. As we move forward with this new form of governance, and as our board gains an even deeper understanding of our great institution, I believe you will see the board begin to help shape our mission and identify new opportunities that will complement the quality programs and activities we have on our campus. 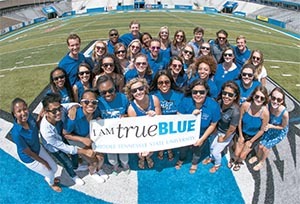 In the end, I believe this new level of independence is truly bold and potentially transformational for MTSU. I look forward to learning and exploring the opportunities this new landscape will provide toward our mission of ensuring student success and providing more graduates for the state’s workforce. This is our time for transformation—our time to seize the opportunity to innovate and transform. True Blue! I am avaluable contributorto its progress and success. I am engaged in the life of this community. I am a recipient and a giver . I am a listener and a speaker. I am honest in word and deed. I am committed to reason, not violence. I am a learner, now and forever. I am a Blue Raider. Hack-MT brings together college students annually for a regional hackathon, where young programmers, software developers, visual designers, and others team up for projects during a 36-hour competition. MTSU offers programs both in Computer Science and in Information Systems. There are three Nobel Prize winners associated with MTSU. The actual Nobel medal awarded to 1940 graduate James M. Buchanan, a pioneering economist, is on permanent loan to the University. Founded in 1911 as a teacher-training school, MTSU is still one of the finest teacher preparation institutions in the Southeast. The newest doctoral program, the first of its kind in Tennessee, is the Doctor of Education in Assessment, Learning, and School Improvement. MTSU is now home to WMOT 89.5 FM Roots Radio, the region’s only station devoted to the burgeoning, singer/ songwriter-friendly Americana format. A new academic classroom building for MTSU’s College of Behavioral and Health Sciences—to serve Criminal Justice, Psychology, and Social Work—is next on the state higher education’s capital projects. Ranked No. 7 in priority is a building for Engineering Technology and Mechatronics Engineering.